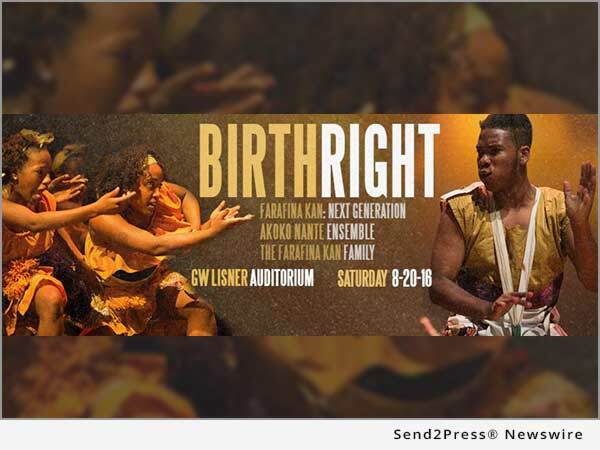 WASHINGTON, D.C., Jul 27, 2016 (SEND2PRESS NEWSWIRE) -- Brought to you by The Adinkra Group, "Birthright 2016" is a captivating evening of live intergenerational performances by Washington D.C.'s most talented African dance and drumming ensemble and special invited guests. A night of elegance, August 20, 2016, with guests sheathed in African chic couture sets the back drop for the electric and inviting atmosphere attendees have come to know and love when attending this event. In its third year, this invigorating stage performance acts as a coming together of community. In this current climate of unrest, The Adinkra Group aims to highlight how traditional African values can salve many of the issues we are facing today. Enjoy performances from Farafina Kan: Next Generation led by former junior company members who have completed high school and begun their college career performing their own musical and dance choreography for the first time. Special guests based in Queens, N.Y. this year are Akoko Nante Ensemble bringing the spirit of Ghanaian, Haitian, and Cuban Folkloric music and dance to the stage performing for the first time in Washington, D.C. The entire Farafina Kan Family: the Denu group (ages 3 - 7), Youth (8 - 14), Junior (14 - 18) and Adult performing companies will also bless the stage. Held in George Washington University's storied Lisner Auditorium, Birthright 2016 will empower, educate, and uplift the viewing audience while inspiring them to take action in their own communities. The Arts can heal and rebuild. Birthright 2016 is epitome of art in action to bring change. Please contact us to reserve press passes. The Adinkra Group is a cultural entertainment and resource company based in the Washington, D.C. area committed to partnering with local, national and international performing, teaching and visual artists and arts organizations that hold at their core and promote progressive messages of humanity through their varied forms art. The Adinkra Group is committed to providing high quality superior presentations that entertain, educate, motivate, and inspire action towards creating a better human experience for all people.